This is another self-explanatory month - don't you love it when its easy!? Honestly - when is the last time you surprised your partner? Here's the trick this month - you both have to sit down and agree to do MORE THAN ONE surprise for each other! Remember when you did a Secret Santa gift in school or at work? Were you one of those people that did an amazing job at repeatedly surprising your gift-ee? Were you also one of those people who got a lame Secret Santa who claimed to be too busy? Well, no excuses Partners - buckle up and enjoy some fun surprises this month - TOGETHER! For starters, how about a simple little sticky note left with the morning coffee?? Still not enough? Try secretly securing a babysitter one night for a surprise night out! And you'd be amazed how far a surprise cleaning or fix-it project will go! It's not brain surgery - it's just something unusual - and MUTUAL giving is very important on this one - don't fly solo! For Valentine's Day ideas, check out this page. 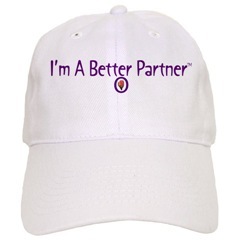 A Be A Better Partner Hat! The Be A Better Partner Plan is designed to be a mutual decision you make together. If only one of you is doing the 'plan' then you are not fully gaining the benefits of all this can do for the two of you. Similarly, when only one person is doing the 'surprising' then what happens to that other person?! Without imposing strict limits this month, try to make a commitment to a specific number of surprises. Its just not fair to have one person creating a surprise every other day while the other creates just one or two. Sit down, talk about a number and stick to it - or at least try to! The idea is not to compete for best or most surprises, but to add some spice, and create moments in your day when you really think about what your spouse loves. So, beyond just Valentine's Day - set up a plan for the rest of the month - schedule dates or set numbers or whatever but talk about it - this is the part that shouldn't be a surprise! Finish something you started but is left undone (possibly something irritating your spouse!? Decorate your food in the shape of a heart - raspberries maybe? Still need help? Hit the bookstore for inspiration & ideas. For more ideas, visit the Surprise Me Month page or our special Valentine's Day page.